A few years back, Alina Zagitova nearly was sent home from training for not working hard enough. Now, she heads home with Olympic gold, the first for the Russians at the Pyeongchang Olympics. 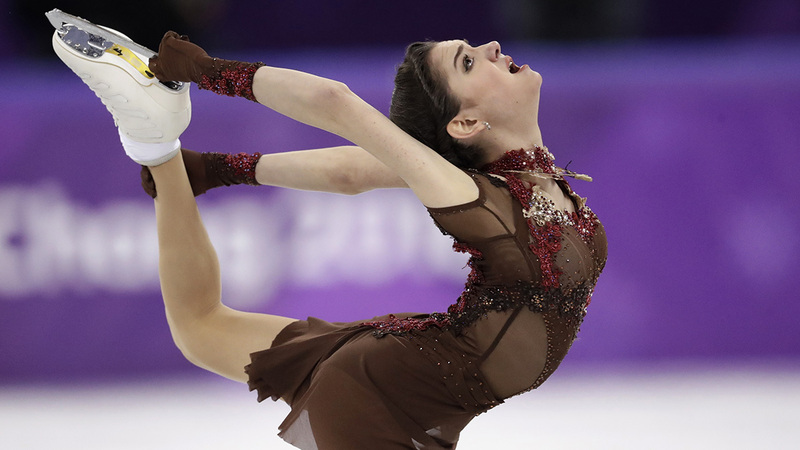 A grateful nation — upset that their flag, anthem and dozens of athletes were banned from the games because of a doping scandal — can thank the 15-year-old who beat the 18-year-old who had inspired her to become a figure skater, Yevgenia Medvedeva. And thank their coach, Eteri Tutberidze, who gave the less-than-diligent Zagitova one more chance to prove herself when she wanted to quit. "My hands were shaking, but my body was doing everything I'd trained to do," Zagitova said Friday after a rare tie in the free skate earned her the top spot because she beat Medvedeva in the short program two days earlier, when both women broke the previous world record score. "I can't believe I am the champion." "I felt strong and in the best shape that I've ever been in my entire life, she said. "I can't believe that I ever thought about retiring." Zagitova's victory in one of the games' spotlight events ended the gold drought for the Russians and added another chapter to her battle with her friend and training partner. It could become a skating rivalry for the ages. "I've got a big life in sports ahead of me and I want to keep going for many years," Medvedeva said. "I can do more in this sport," Zagitova added. "There are a lot of titles to win and the Olympics is the biggest." Medvedeva seemed well on her way to Olympic gold as she went unbeaten for two seasons. But she battled a cracked bone in her right foot this season and Zagitova emerged, eventually surpassing Medvedeva. Medvedeva had set a world mark in the short program, and a few minutes later her countrywoman beat it. The difference in the short program wound up being the exact margin — 1.31 points— between gold and silver. On Friday, Zagitova went first, greeted by loud chants and cheers from the Russian fans desperate for that first gold. She nailed everything with fluid flair and technical brilliance. Zagitova earned 156.65 points for her program to "Don Quixote," laying down the challenge for her countrywoman. "I didn't feel competition, I felt I didn't have the right to a mistake," she said. "That gave me a boost, and nerves, too." Medvedeva matched the performance, but that was not enough. The U.S. women had a disappointing showing in figure skating in Pyeongchang. Their struggles in the short program carried over into the free skate. "I wanted to leave everything out there on the ice," she said. "I've got no regrets." Zagitova backloaded her program that featured 10 jumps, earning bonus points for difficult tricks late in the free skate. She needed every point. Her poise on the ice and off — unlike many of the other competitors, no tears flowed from Zagitova — belied her years. Whether she can follow up this triumph with more, unlike 2014 Sochi winner Adelina Sotnikova, who has struggled since — will be fascinating to watch. Other than Mirai Nagasu's triple axel, it was not a memorable Olympics for the American women. They finished ninth, 10th and 11th, their weakest showing since World War II. Sixth place had been the low point. Nagasu, fourth at the Vancouver Games in 2010, became the first American woman to land that 3 1/2-revolution jump in an Olympics, helping the United States take the team bronze. From there, it was downhill. She never got elevation for the triple axel Friday and ended up 10th. She was one spot in front of Karen Chen, the 2017 U.S. champion. Bradie Tennell, this year's winner at nationals, was ninth. Chen fell once and had bobbles on other jumps and moves. Tennell, who heading to South Korea hadn't missed a jump all season, twice stepped out on planned combinations. "I think we all could have skated better, but you know, you knock us down and we get up to fight," Tennell said. Both Chen and Tennell are expected to keep skating and will need vast improvement to catch up to the Russians, Japanese and Canadians who have come to dominate the women's event. Italy's Carolina Kostner, the 2014 bronze medalist, was fifth, one spot in front of Japan's Kaori Sakamoto.